I've been posting over the past 2 months the projects that have been bits and pieces of Kate's new bedroom. This has been a fun project for us to do together. Kate gathered all the new bedroom ideas herself and then funneled her final decisions to me. So, a mere 2 months after we started, I think we are just about done with her bedroom. Before we get to the good stuff, let's look back at where we started. It wasn't awful, but it always felt a little mish mash…like there wasn't a cohesive plan. The color was chosen when Kate was in 6th grade aka ‘middle school'. She was ready for a new color and a more mature-feeling room. I neglected to get a photo of her bulletin board before we took the frame off of it. 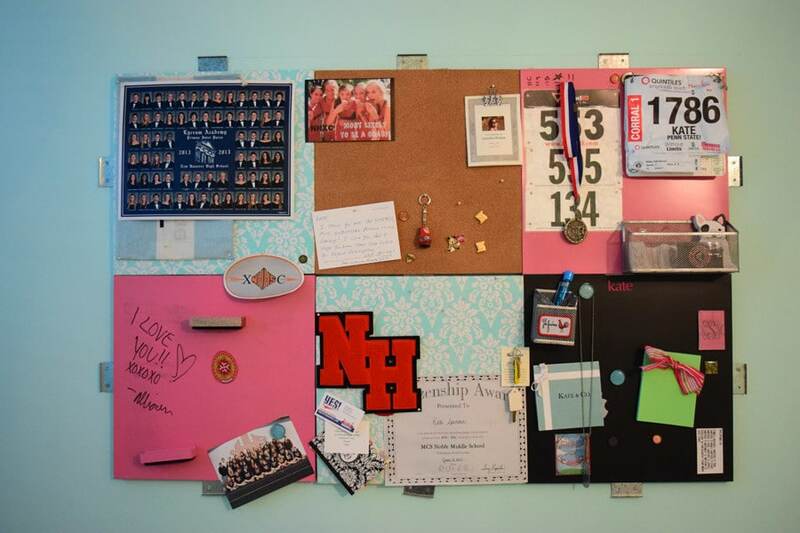 This bulletin board ‘system' was purchased from Pottery Barn Teen, 7 years ago. 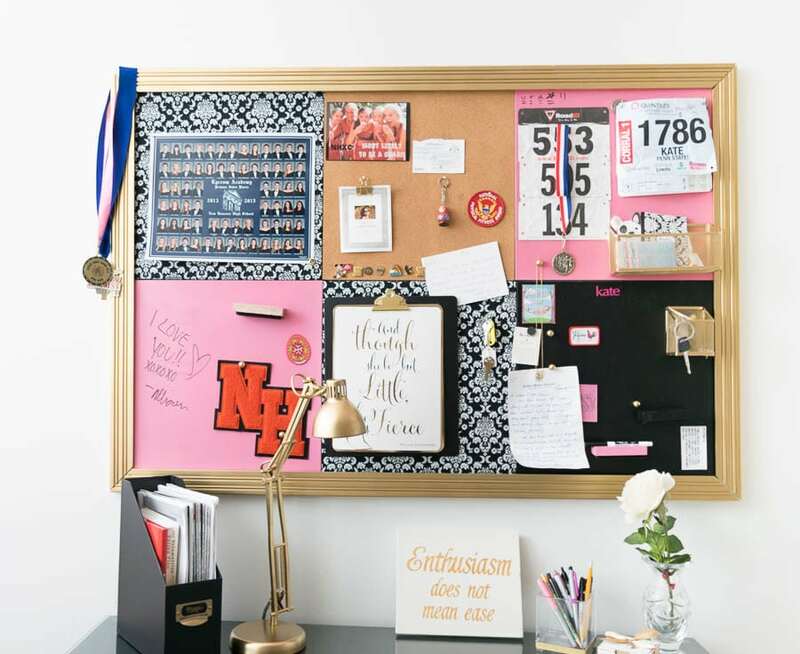 It's a great bulletin board system, allowing you to customize how many chalkboard panels, cork panels or magnet panels you want and what colors. She chose the colors to coordinate with her color scheme at the time, which is going to change a bit now. We painted her walls white. It took two coats to cover that aqua even though the paint was a ‘one coat' paint. We used Behr Marquee Simply White (a Benjamin Moore color). For what it's worth, I'm not sure if it was because of the high humidity when we did our spray painting, but the Valspar kind of bubbled on the desk. We ended up sanding those spots and spray painting them with a primer and then re-coating them with the Valspar lacquer. We didn't have any problems on the iron bed. We spray painted the frame around her bulletin board in the gold. It was previously white. We also recovered the two aqua panels using the black & white damask cotton print fabric. The ‘Enthusiasm does not mean ease' (above), her gold initials and the gold state of NC (below) were gifts to Kate from a good friend of hers at graduation. Such a sweet and meaningful gift. The mirror, large K and frames on her gallery wall were existing items that we spray painted gold. I created the two predominantly pink pictures in her gallery wall. The picture of the pumps and jeans, as well as the back of the head are photos we took and ran through Waterlogue...one of my favorite apps. The print of the black pumps with blue jeans and the watercolor with gold leaf print are available on Society6. We fixed, repainted and reupholstered a rather sad bench to create the gold, fuzzy glam bench at the end of her bed. We sewed many pillows. 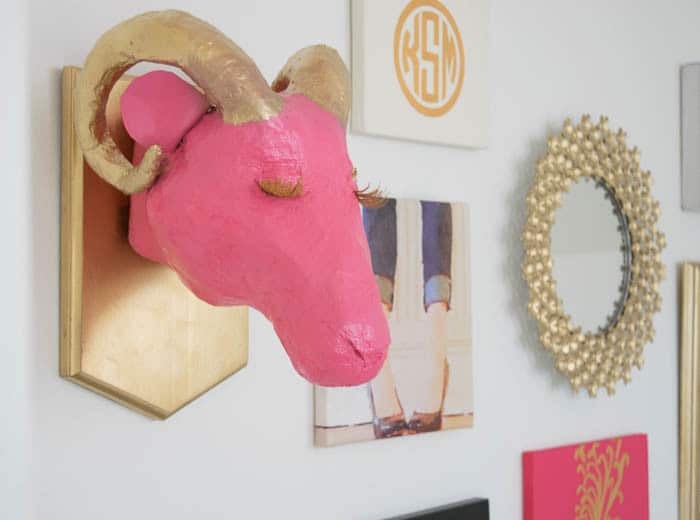 I paper mache-d the faux ram trophy head in her gallery wall. We purchased the black and white duvet cover. In truth, we didn't spend much for this redo. Paint and labor were the biggest investments in this room. This chandelier used to be a pale pink and green and then we painted it silver. You now know that I wasn't exaggerating when I've said in the past that I'll paint just about anything. 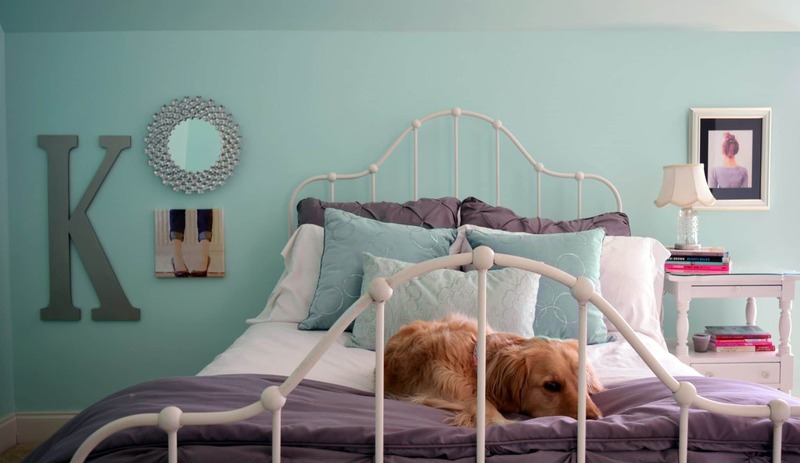 If you need some additional Teen Bedroom Inspiration, Shutterfly has put together a great collection of 75 Rad Teen Room Ideas for further inspiration. Head over to check them out. Thanks again for stopping by today. I really appreciate your company more than you'll ever know and hope you’ll stop by again soon. If you want to make sure you don’t miss future content, pop your email in the beige box up on the right. I usually send out 2-3 emails a week, so I won’t inundate your inbox. Lynn the room looks really great. Very pulled together and cohesive. I love all of the little details you have paid attention to. I also redid my daughter’s room a few months ago but she would not let me paint everything I wanted to. Your girl was much more cooperative. The room is very pretty with the three primary colors. As for the chandy, my first choice would be black.. Of course, you know I’m a fan of black. Hi Mary, thanks for the compliments and thanks for the vote. Actually, I really wanted to do Navy blue instead of black, but Kate was set on the black, so I did have to defer to her. And I wanted to do some other fun things to the desk that she shot down. But by and large, we were in agreement. It does make it easier. Such a beautiful girl’s room! I love how preppy it is, too! Love it! Hi Ilka! I’m so glad I finally found you! And thanks for stopping by. I’m loving how it all turned out, it really was a fun project though. I say go for it and paint it pink. You can always paint it again if you don’t like it. True that Karen…I am the queen of repainting. Thanks for your ‘vote;! The room is so tastefully done, and absolutely gorgeous! I am obsessed with gold right now, so I would probably paint it gold, but the pink would pop! Hard decision! Whatever you decide will be beautiful, I’m sure. Thanks Sherry..I’m kinda right with you. Leaning gold but really tempted by the pink. Very much appreciate your input. The room looks great! I’m leaning towards gold for the chandelier. 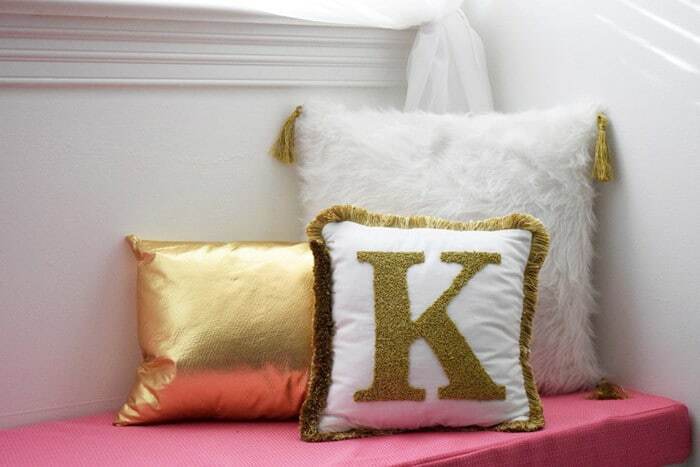 It will balance really well from any angle with the gold “K” and the the table lamp. Thanks Liz! Your vote has been tabulated! Really appreciate you stopping by and chiming in. It’s nice to see the whole room in its entirety! You really have worked hard and have the awesome results because of it. My vote is gold! The room looks amazing! You are so good at redoing old items and making things like fresh and new. I’m also really impressed with the paper mache rams head. That is no easy feat!! It all ties in really well and has a great balance of the color palette. I’m torn between black and gold for the chandelier. I want to say black because I think that would be bold and different. But, at the same time it’s really close to the concentrated amount of black in the bed area. So, I would vote gold. I think it’d keep the balance really well. Can’t wait to see what you decide! The room is beautiful, Lynn! Makes me think of my granddaughter. I painted a wall mural on a wall when she was younger, then they moved and now she has that tween room, but she’ll be 13 this summer and I know it’ll change again in a few years. Anyways, does Kate have any thoughts on the chandelier? I’m thinking either all gold or pink with a touch of gold. And I love the ram! What a GREAT room!!! I love all the colors and textures you chose to work with. The best part will be the memories you two will have from working on the room together though. You are so right Carrie, Kate and I had some great times planning and working on her room and that is the best part! Thanks for reminding me. And I need to give Kate all the credit for the colors and textures she chose. What a fun project to work on with your daughter! It turned out great! My vote is for gold 🙂 I can’t wait to see what you choose! Another vote for gold…think that’s going to be the winner. Thanks for swinging by and for chiming in with your vote. I like the pop of color with the use of pink and the frame around the board. beautiful! Hi Celeste…thanks for the compliments. We are very pleased with how it turned out. Has pops of color, but not too busy. This room looks gorgeous dear, you did a great job dear. Ya we have seen some of your DIY projects. You are very creative, I need some lessons from you. Hi Sadhna, you are so kind with your words. I’ve been a DIY-er and crafter for ever as both my grandma and mom were…it’s what I love to do, so your compliments are so appreciated. Thanks for coming by to visit today. i absolutely love this! the glam ram is the coolest! :p what I think is fantastic is how you repurposed so many things and gave them a new lease on life and it all looks amazing!! Thanks Charlotte! The Glam Ram is one of my favorite things about the room…so glad Kate thought of it. And I’m all about re-purposing. AFter de-cluttering my home earlier this year, I am loathe to bring stuff back in. The space looks fantastic! What a great upgrade! My vote: I’m between black and gold. Black and Gold…got it! Think I’m leaning gold, though that pink is still calling me. Really appreciate you chiming in. Hello Lynn! I finally get to check out your daughters beautiful bedroom in full screen instead on my phone while out and about. Way better this way! How beautiful it all turned out Lynn! I like the colour scheme, the pink & gold is beautiful and while I’m not a black fan I must say it really looks great in this combi, the bed is stunning and all the little black accents here and there make it really a teen~girls~and~up~bedroom! Love it! I vote for a matte gold for the chandelier! Have a great day, will be watching the latest WD later on! Hugs! Welcome home Katrin. Did you have a ball? I know you did by your photos. Thanks for commenting on Kate’s room and chiming in on your color vote. Think that’s what I’m leaning towards. It was fun to do but I’ll be glad to put it to bed…no pun intended! Watching HD tonight! Such a cute room! Love it! This is so beautiful! 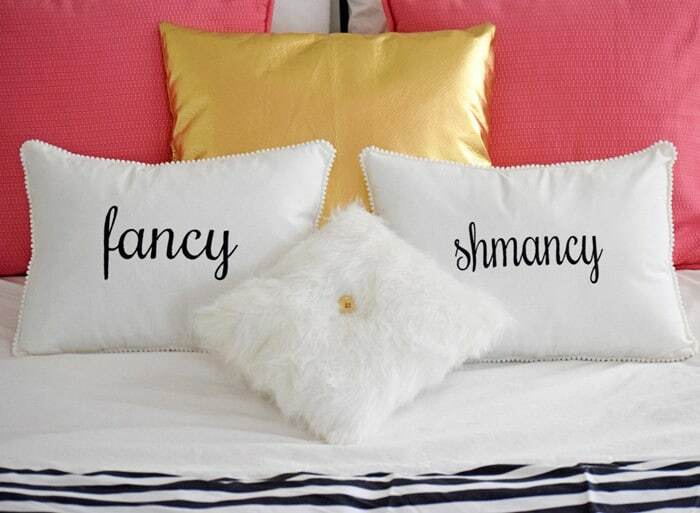 I want it for my own bedroom! Ha! It looks so pretty. Love the gold. Hi Brittney…thanks so much for swinging by today and dropping a kind comment. I’m pretty tickled with how the room turned out as well…it may be the most ‘put together’ room in the house, for sure. So the gold…hmmm…that seems to be the most popular vote thus far. Hi Nikki…and here’s the rub…that pink chandelier is calling to me…all.the.time. I so want to paint it pink! But…the practical side of me is trying really hard to tamp it down. What hasn’t been said is that we are planning to put the house on the market in a matter of months and while I don’t think someone wouldn’t buy because it has a pink chandelier…there’s that whole…neutral colors sell best frame of mind. But I need to do something soon because the silver is just…yuck. Thanks Lisa! I’m thrilled to be featured and I will swing by and visit you this week. Thanks so much for the feature. What a great update! I am sure you and your daughter had a wonderful time working on the project together! I think to add a touch of the pink in the chandelier up high would be fun. You know you can always re-paint it if you choose! Thanks so much for sharing over at Celebrate Your Story! I think I’d like a room like this and I’m casting my vote to paint the chandy pink! Pink! That’s what I’m leaning towards as well. If it’s too much it could always be repainted…right? Once again, thanks for swinging by and leaving your comment and your vote! It means alot. Hi Lynn, I know it’s really last minute and you probably already painted the chandelier but I have an idea for you. I think you should do the main part black, the candles pink and the candle cups and accents gold. If you don’t want to do all of the taping off, you can use plastic wrap to cover the areas while your not painting them. Holy cow…what a great idea. I did paint the whole thing pink several months ago, but…there’s no law that says it has to stay that color…right? Thanks Shawna and hope you have a wonderful weekend.